Have you thought about pursuing your love of yoga beyond the realm of your personal practice? Embarking on the journey through 200-Hour teacher training will make you grow immensely as you connect with your mind, body and spirit. You’ll dive into a life-changing educational experience where you’ll bond with like-minded yogis and explore the many pillars of yoga. Even though teacher training is a very exciting time of life, there are also many questions and apprehensions that come along with starting something new and unknown. You might be thinking, “How am I going to be successful in a career when I’ll be so new compared to other yoga instructors?” Every yoga teacher has gone through the “new” phase in their career! It’s an invigorating time to learn, listen and spread your wings. Here are some tips to make you feel confident in your choice and continue towards a new career path. As a novice instructor, you might find that some students are surprised by your inexperience when you first begin to teach. They can be skeptical of you all they want, but don’t for one second let them inflict self-doubt. If you find yourself in this situation, try to put yourself in their shoes and understand them instead. Maybe they’ve never had a recent graduate as an instructor before, or maybe they have some built-up negative energy that needs to be released in class. Whatever the reason may be, you will have something to offer them. You will win the respect and admiration of your students by teaching with confidence. Your role is to be a soothing, comforting voice for your students for the hour or more class that you teach. Share your thoughts and wisdom confidently and proudly. Practice your sequence and pronunciation so that you feel prepared going into your class. And remember to be patient with yourself always. It will take time to master a powerful, confident voice, but you will get there! Remember, you’re just starting out, so you’re not going to know the answer to every question that comes at you. If this happens, the best way to approach the situation is to just be honest with your students. Help them if you can, but then give them the resources they need to get further answers. Having someone you look up to and can confide in is one of the greatest ways you can support your career and grow in it. Find a mentor that you trust and respect that you can bounce ideas off of and learn from. Get coffee with them or take one of their classes to observe their teaching practices. Continue to wear that student hat and learn as much as you possibly can. As a novice instructor, you’ll be faced with challenges just like every other instructor. The bottom line is to overcome those challenges and use them to step up your skills as a teacher. Have confidence and fearlessly take on your future! We love rolling out our mats, connecting with ourselves and learning from the wisdom of instructors in class. But yoga is so much more than just the practice of poses and a time to work on personal growth. The principles set in yogic tradition are the real gems of the practice. They are what nurtures us and sets us on track to how we should treat ourselves and others in this human life. A common principle embedded in the core of yoga life is that of ahimsa, which means causing no harm of any kind, not only through actions, but through words and thoughts as well. This principle of kindness encompasses all things. Ahimsa pertains to how you treat your body, the earth, animals and especially other people. Not only is it rewarding, but there are numerous benefits associated with showing kindness. Have you noticed that when you do something kind for someone else, you end up feeling better too? This isn’t just a coincidence. Acts of kindness boost your serotonin, the neurotransmitter that releases feelings of satisfaction and well-being. They also release endorphins in the same way that exercise does, so you feel that “euphoric high”. Make goals to volunteer, help someone in need or buy a coffee for a stranger and see how one act of kindness can make your day just that much brighter. Show kindness towards someone else and keep yourself healthy too! It’s just that simple. Please join us on Thursday, April 25 for a drop-in or community class. Ten percent of these sales will be directly donated to Our VOICE to support their work within our community. If you are unable to make a class and still want to support this cause, donation boxes will be available in the Studio and Boutique from April 1-31. We all know that a regular yoga practice offers multiple benefits for the body, mind and spirit. These benefits include increased flexibility, enhanced physical strength, clarity and calm for the mind, better circulation and so much more. For women specifically, yoga can support wellness through every stage of life, from child to child-bearing years, prenatal and postnatal, and beyond. Of all the yoga’s offered, Kundalini Yoga in particular has rich, deep and specific teachings for those that identify as women. The man who brought the teachings of Kundalini to the United States, Yogi Bhajan, was incredibly inspired by women, beginning with his mother and grandmother. More than half of the legacy of teachings that Yogi Bhajan shared were dedicated to spreading the ancient sacred teachings of yoga with women specifically. The motivation to reach women with these teachings was based on his deep belief that the world would never know harmony or peace until women had their rightful place of recognition and respect in the world. While students of Kundalini are immersed in this rich understanding of the role and power of women, many more students in this country are told that as far as women and yoga go, the history is recent. This story has been created by western teachers and unfortunately, yet somewhat reliably, centers a white woman, Eugenie Peterson, as one of the first women to practice yoga. Eugenie Peterson went on to be known as Indra Devi, and while Indra Devi did contribute greatly to the story of yoga in this country, by no means was she the first woman to practice yoga. Wittich continues to point out in her paper, “Yoga and Women: A Possible History,” that later texts, ones that many of us are much more familiar with, including several of the Upaniṣads and the Mahābhārata, mention wise spiritual women and go so far as to define some as “yoginis”. All of which to say, isn’t it time that we stop centering Indra Devi in the story of women and yoga and reach back through time, as yoga itself does? Not only does it feel more powerful to acknowledge that women, especially dark-skinned women, have been practicing, shaping and creating yoga for as long as yoga has been around, but it is also true and gives yoga back its roots and truth. The practice of yoga, for women by women, is deep, profound and a celebration of the nature of women, our monthly cycles as well as our life cycles. By practicing this way, we open ourselves to the flow of energy rather than achievement of a posture. The journey, rituals and experience of the practice, rather than the physicality of the practice, are paramount. More than anything, we understand that yoga is who we are, rather than what we do. If you’d like to learn more about women’s role in yoga, here are a few resources for you. Sierra Hollister offers a weekend immersion each year for women that wish to understand more about their unique yogic path, “The Moon Path” at Asheville Yoga Center. Dates this year are April 26-28. If you’d like to attend this weekend workshop, please click here to register. Sierra will be offering a “Rejuvenation Meditation with Gong” workshop on March 22. This evening will be comprised of some gentle movement, breathwork and then meditation with the gong. If you’d like to attend, please register here. Sierra also teaches Gentle Kundalini on Mondays at 10am and HOT Kundalini Flow on Thursdays at 7pm. One of the most humbling and beautiful principles of yoga is “seva,” the Sanskrit word meaning “service-mindedness.” In ancient India, seva (pronounced seh-va) was thought to improve an individual’s spiritual growth through acts of selfless community service. It is the essence of giving without any intention of receiving anything in return. In March, Asheville Yoga Center will be fundraising for Pisgah Legal Services, a local innovative non-profit law firm that has been serving Asheville and the greater Western North Carolina area since 1978. The organization provides legal assistance and advocacy to help low-income individuals meet their basic needs and improve their lives. Their work includes helping more than 15,000 of the most vulnerable people in our communities annually to meet needs such as housing, safety from abuse, health care and income. AYC is fortunate to share similar values with those of Pisgah Legal Services. As a yoga center, we are dedicated to inspiring others to recognize their worth and greatness and support each other to create the environment and resources necessary to live a healthy and meaningful life. If you wish to make a monetary donation, donation boxes will be located in both the Studio and Boutique all month long. Join us at the Studio for a class on Thursday, March 28. Ten percent of all community and drop-in class sales will be donated on this date. As spring stretches out her sleepy fingertips to nourish our earth in this new season, we too must nourish our community. Join us as we work to support this amazing organization and help our community continue to grow and blossom through advocacy and service. To learn more, a representative from Pisgah Legal Services will be at the Studio to answer any questions as a part of our donation day on March 28. The practice of yoga can be described as boundless, with boundless subjects tied into it. Memorizing every single muscle, bone, node and valve in the body is not necessary to experience the beauty of asana. However, it is nice to know some science behind certain aspects of a yoga practice so that we can find the strongest versions of ourselves with a little help. Asana, in and of itself, is a vast subject. We are just going to cover a small portion relating to muscle stretching: specifically, active and passive static stretching. Every single skeletal muscle in our body has at least one origin and insertion. Let’s break down what that means exactly. The origin of a muscle is typically closest to the midline of the body and is more fixed in a contraction. In contrast, the insertion is more moveable. For example, part of our bicep muscle, the biceps brachii, attaches its origin to the part of our shoulder blade called the supraglenoid tubercle of the scapula. The insertion of this muscle is located on a bone in our forearm called the radius. Stretching creates greater distance between the origin and insertion which stretches the biceps brachii by lengthening the arm. When we stretch muscles, our nervous system dictates how far we can go in a particular stretch. We have receptors that monitor muscle length and let us know when we are stretching too deeply. These receptors alert us with an intense, unsustainable sensation which prevents us from tearing or overstretching muscles. It’s up to us to be persistent in our practice to find greater muscle stretch tolerance and flexibility. We need to enter stretching with a sense of repose so that our nervous system reduces its grip on a stretched muscle over time. Many factors can cause reduced joint range of motion, and muscle stiffness is just one piece of the puzzle. Muscle tightness, consequently, comes from increased tension from active or passive mechanisms. Habitual posture and muscle scarring are both passive ways muscles can develop tightness and spasms. Repetitive muscle contraction is an active way that tightness can occur. 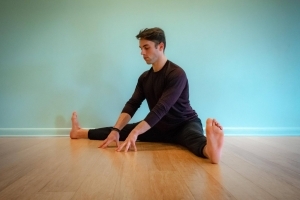 This technique can be practiced many ways in asana, and if you’ve taken a class, you’ve probably experienced passive static stretching in at least one way. This type of stretching uses gravity and body weight as tools to facilitate muscle stretching. You can hold these stretches for up to 30 seconds (or even longer) as you allow the nervous system and stretch receptors to acclimate to each shape. 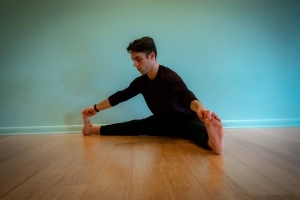 The idea behind this kind of stretching is to find a sensation in the body that can be sustained with steady breath for the whole duration of a held stretch. A sense of relaxation and ease can often be felt during and after this style of stretching. Here’s an example of this type of practice: Set yourself up in a wide-leg seated forward bend (upavistha konasana) allowing the torso and pelvis to tilt forward. Round forward in the spine and allow gravity to help you find depth in the posture. Props can be very handy with this style of stretching as well. Try modifying your pose by using a blanket or bolster to support the pelvic tilt. Active static stretching has more muscle involvement compared to passive static stretching. You use little to no assistance from anything external in this type of stretching. Instead, you use muscle support to find a good stretch. Many movements and stretches in yoga can be active stretches, but it’s up to you to find what you’re comfortable with in your own practice. If you want to achieve an active stretch, it is necessary to involve the agonist muscles as well as the antagonist muscles. In short, using wide-leg seated forward bend as an example again, focus on the agonist muscles (quadriceps) and the antagonist muscles (hamstrings). As you activate the quadriceps, the hamstrings in turn can receive a signal to soften a little bit more through something called reciprocal inhibition. Active stretching can help strengthen the agonist muscles as well as build a higher stretch tolerance for the antagonist muscles. These stretches are typically held with many muscles active for shorter durations lasting around 10-15 seconds. For wide-leg seated forward fold, keep a straight spine as you engage the quadriceps, hinging from the hips to walk the hands forward and achieve a stretching sensation in the hamstrings. A waterfall of physiological responses occurs during stretching, but one of the coolest responses from the body is the release of endorphins from tiny tears in the muscles. The “good feeling” from endorphins can easily override the potential sensation from muscle tears, which is why stretching can be pleasing. Pair that with some slow breathing and you and your nervous system will be ready to take on anything. Elements such as anatomy and physiology can make the entire understanding of yoga seem unreachable within a lifetime. However, understanding small chunks of information often leads us down a path to understanding the larger picture. We hope you find this supportive as you further your yoga practice and education. If you want to take a class with Forrest, see his class schedule below! What exactly is Yoga Nidra? Nidra is derived from the Sanskrit word meaning sleep or slumber. It is a meditative and relaxing practice intended to bring the body into complete physical, mental and emotional rest. This deep dive into conscious relaxation promotes a restorative state for the mind and soul to decompress. However, there are still many misconceptions regarding this particular practice of yoga due to its “sleepy” and meditative state. How can you determine if what you hear and read is true or false? We asked Indu Arora, world-renowned yoga teacher and Yoga Nidra expert, to share her passion and extensive knowledge with us. Here are her responses to some frequently asked questions. What’s the difference between Yoga Nidra and guided meditation? In meditation, you are trying to lift dormant energies up towards higher energy centers by gathering scattered pieces of the mind. However, in Yoga Nidra, there is a total dissolution of all possible energies and states of mind. It is a common misconception to classify Yoga Nidra as a type of meditation. For meditation, it is really important for the spine to be upright and to lift up the body’s energy. In contrast, the common posture of Yoga Nidra is supine and relaxed. Meditation begins with concentration, and Yoga Nidra begins with relaxation. Meditation is practiced in order to master the mind. Yoga Nidra, on the other hand, is practiced to unveil the state of consciousness which controls the mind itself. Is there a “best time” to practice nidra? In the beginning stages, it’s great if you can practice whenever you feel the most inspired or when you can find time out of your day for it. However, if you would like to benefit from the cyclical rhythms of the body, it’s best to practice upon waking up or just before going to bed. These are both optimal times to tap into the unconscious through subconscious realms. It is very important not to practice nidra when you are feeling tired. If you end up practicing tired, it’s likely that you’ll fall asleep, and that is not the goal. Nidra is not a practice that’s meant to release tiredness. If you are working on fatigue or insomnia, it is much better to practice relaxation or savasana. Do you have to practice asana before nidra? This really depends. If one can maintain alertness without experiencing roughness, tightness, restlessness, pain, discomfort, shakiness, sleepiness, dullness, absence of mind, etc., then there is absolutely no need for asana pre-practice. I place a lot of importance on pre-practices, as well as post-practices, in the case of Yoga Nidra. It really demands steady preparation, because we are not naturally born ready for such deep practices. We must build a certain physical, mental, emotional and energetic appetite for them. What’s the true origin of Yoga Nidra? In all fairness, it’s difficult to say what the true origin is. As a start, I can point to the most ancient text called Rig Veda. It talks about the Glory of Night in Ratri Suktam. In this text, Yoga Nidra is revered as a goddess. What do you feel is most important about a Yoga Nidra practice? It is important to understand what it is that you are doing before you start doing it. One misconception can easily lead to another. Moreover, it is very difficult to unlearn what you have already learned. It’s important to pay attention to the source you are studying from, whether it’s a person, text, video, audio or an app. The best way to go about a practice is to study in person from someone who has practiced Yoga Nidra. Don’t put all your focus on just learning technique. After all, knowledge is the most subtle type of food. If you are careful of what you eat, you must also be careful of what and from whom you study. A Yoga Nidra practice is an incredible tool to become at one with your mind and your body. Take the time needed to digest what you learn and continue to study with the truest and sincerest desire to grow. If you’re interested in learning more about Yoga Nidra with Indu Arora, you can register for her 5- Day Yoga Nidra Intensive workshop February 25 – March 1. Learn about the history of Nidra, its origin, benefits and more during this informative and unique opportunity! If you are unable to make it to Indu’s workshop, come by the Studio for a Yoga Nidra class offered on Thursdays at 7:15 pm. Asheville Yoga Center is rolling forward with its Charity of the Month project in February. The center will be raising funds for Asheville on Bikes for the second consecutive year. The non-profit advocates for better biking and walking infrastructures in both Asheville and the surrounding regions of Western North Carolina. They work to spread awareness for actions to be taken to build better transit, roads and public places. “We understand the importance of providing the utmost safety for other’s health and wellness. Improving sidewalks, greenways and infrastructures allows us to meet those goals and create harmony within our community. We greatly appreciate all of the work that Asheville on Bikes continues to do, and we’re proud to be able to partner with them for a second time,” says Melissa Driver, General Manager of Asheville Yoga Center. Beginning February 1, donation boxes will be located in both the Studio and Boutique for monetary donations. On Thursday, February 28, 10% of all drop-in and community class sales will be directly donated to the non-profit. Please join us for class or stop by the Studio or Boutique to show your support. “Asheville Yoga Center and Asheville on Bikes are such good partners, because our work intersects at the issue of health and wellness. Asheville on Bikes works to improve the conditions of the urban environment through active transportation, while Asheville Yoga Center approaches health and wellness through yoga. Both groups rely on community to impact individuals. Asheville on bikes appreciates Asheville Yoga Center’s ongoing support. It’s a team effort to keep good things rolling forward,” says Mike Sule, Director of Asheville on Bikes. Asheville on Bike’s biggest event, Bike Love, will take place on February 23 as the organization’s signature fundraiser. If you’d like to attend and purchase tickets, click here. To learn more about Asheville on Bikes, please visit www.ashevilleonbikes.com. We find ourselves very fortunate to live and practice in Asheville where the values of businesses, as well as individuals, include thoughtfully caring for the community and those in need. Even with its growing popularity and population, Asheville still emphasizes the importance of supporting all things local. If you look around at some of the city’s most prominent restaurants, breweries and shops you’ll find that they commit, in their own unique way, to supporting local non-profits in both Asheville and Western North Carolina. Whether its hosting a charitable event, fundraising, or giving donations, we find our community to be a very special and loving place. As yogis, we believe that giving back is part of our calling in this life. One of the ethical principles of yoga is “seva” or “service-mindedness.” It teaches us to live in a way that is intentional, compassionate, self-less and above all, supports the well-being of others. But it’s not enough to just learn this principle without taking it to heart and putting action behind it. Part of yoga is practicing the principles and values learned on and off the mat. For this reason, we implemented a few ways to give back to those in need and to the community in meaningful ways aligned with our practice of service. 2019 will be the 7th year of Yoga in the Park, a series of donation-based yoga classes that raises funds for Homeward Bound and United Way of Asheville and Buncombe County. Classes occur every Saturday morning during the summer months. Individuals love this opportunity to bring their practice outside, enjoy warm weather and get together in a large community setting. Although we found success in these efforts, we still felt that there was more we could do to help the community. So in 2017, we implemented a new way to show more support for local organizations. Thus, the AYC Charity of the Month project was born. Each month started out with donation boxes being placed in the Studio and Boutique for monetary donations. On the last Thursday of each month, ten percent of drop-in and community class sales were donated to each designated charity. Additionally, we gave a direct donation of $250. Through our 2018 Charity of the Month project, we were able to raise a total of $4,220 to give back to local area non-profits! What made this year’s project so special was being able to see the direct impact that our contributions made on the community. Our funds, donated to Habitat for Humanity, helped pay the building costs of a house for a family in need. Our food item fundraiser for MANNA FoodBank raised 186 pounds of food, equaling a total of 155 meals for individuals facing food insecurities in WNC. These are just two examples, but it’s these kinds of impacts that are what make this project so meaningful and worthwhile. We’d like to take this opportunity to show our deepest gratitude to everyone who supported our efforts and made this such a successful year! We couldn’t have done it without your generosity and dedication. As 2019 settles in, we’re looking forward to what we can achieve as we kick off the third year of the AYC Charity of the Month Project. Namaste. See our 2019 Charity of the Month partners. Have you ever tried drinking from a firehose? That’s what it can feel like to jump into the 300-Hour yoga teacher training immersion at AYC. The incredible teachers, fascinating subjects and advanced modules are so powerful that it can feel daunting to take it all in. The truth is, you have to be ready to work, learn and transform your practice and your teaching. Most students piece together their 300-Hour credits by taking workshops and trainings on the weekends. This process can take a long time and requires a lot of planning. For those who have to travel to the training site, that’s a lot of back and forth, not to mention the cost of flying or driving. I struggle with this type of learning because it makes me feel pushed and pulled between my home life and my studies. I am the kind of person who likes to dive headfirst into an experience. I barely achieved competency in three years of high school Spanish classes, but when I spent a month in Mexico, I was forced to learn quickly, and I did. For me, it’s all about the learning environment. When I did my 300-Hour training at AYC, back in 2012, I spent a whole month in a mixture of potent self-reflection, complete bliss and utter rawness. My training cracked me open and pulled all the things I’d been hiding from right to the surface for me to confront. I learned even more about myself than I did about yoga during that time (which is remarkable because I cannot begin to tell you how much I learned about yoga). Before my training, I had been out in the world teaching yoga for four years. During that time, I developed some solid classes, and I absolutely loved what I was doing. Still, something was missing. My first teacher training answered so many questions but being a teacher had brought on so many more. I had a few vague ideas about Ayurveda, Yin yoga, Prenatal modifications, etc., but I knew I was no expert. I had met a plateau in my teaching, and something needed to change. That’s when I got the email that AYC was putting together a one-time 300-Hour immersion program, and I jumped on it immediately. The 300-Hour training dipped into subjects that fed my mind, body and spirit. I didn’t even know how hungry I was for the learning until I was swimming in it. We were immersed in knowledge about Ayurveda, Yin yoga, meditation, juicy assists, senior yoga, anatomy and therapeutics, Bhakti flow, chanting, slow flow, restorative, Ashtanga, Jivamukti, sequencing, philosophy, nutrition, pre and postnatal yoga, chakras, sacred texts and more. It was too much goodness in one place! To this day, I look back at my notes, and I learn something every time. The charge of energy and knowledge that I received from this training is still with me seven years later. If you are 200-Hour certified instructor, and you are waiting for a sign to take the 300-Hour immersion program, let this be it. The deeper learning that takes place in the 300-Hour program is essentially graduate school for yoga teaching. You will be asked to be your best self. You must ask difficult questions, hold multiple truths at once, open your mind to changing what you think you know and be willing to shine light on the things that scare you. This may sound frightening, but fear is always present when the ego is challenged to grow. If you choose to enroll in the 300-Hour program at AYC this summer, I guarantee you that you will not regret it. Right now, you can save on AYC’s 300-Hour Immersion! Register by January 31 and receive $900 in savings with discounted tuition of $3395, free books (a $250 value), and a $50 gift card to the AYC Boutique! Classes begin on May 20 and only require 6 weeks to complete! Continue your journey, advance your knowledge of yoga, and immerse yourself in this unique experience. Learn more here. Inversions are powerful postures in the practice of yoga. They can benefit us physically, mentally and even spiritually. In hatha yoga, the primary branch of yoga as practiced in western cultures, the goal of the practice is to raise kundalini. Kundalini is a dormant state of consciousness that is nestled at the base of the spine in all of us and is usually depicted as a serpent. This energy of awareness moves through the central energy channel located in the spine (the shushumna nadi) to the sahasrara chakra, which is the highest energy center located on the crown of the head. This ultimately results in connecting us with Ishwara, our individual version of God. All of this can seem quite esoteric and new-agey. So the question is, how can we understand this on a practical, everyday level? At any given moment we are not particularly aware of where our energy or consciousness is directed. Thankfully, yoga is there to help shed a light on it! Yoga asanas can teach us how to use our mental and physical energy (prana) with purpose and intention. They teach us how to control this prana, and ultimately, gain control of our senses (pratyahara) and consciousness itself (dharana and dhyana). If the goal of the yoga practice is to sublimate this energy and our consciousness to a higher level, inversions give us a shortcut to reversing the typical flow of energy and consciousness. Each group of postures corresponds to energy centers in the body. Inversions are unique in the fact that they flip the entire system and use the natural force of gravity to purify each chakra. The benefits of inversions are vast but include physiologic, psychologic and yogic blessings. Physiologically getting upside down sends a refreshing flow of blood into the lungs, heart and head. They drain the stagnation that builds in our lower extremities due to sitting and standing. According to the Hatha Yoga Pradipika, they reverse aging, improve posture and bring harmony to all of the bodily systems. Psychologically, inversions broaden our perspective! It shows us that there is more than one way to view our world and that our unique perspective is not the only one. Yogically, inversions specifically purify the throat, third eye and crown chakras which correlate to our relation with our self, our teachers and our version of a higher power. I love all of these inversions and their variations for different reasons, but if I had to choose one, I’d have to say forearm stand is my favorite. It is slightly less scary than handstand but more challenging than headstand. Pincha Mayurasana requires not just strength in the shoulders, arms and core but also openness in the shoulders and psoas. To me, it is a good example of the balance between stability and flexibility we aim to strike in the yoga practice and life itself. In my opinion, the best reason to practice inversions is that they are just fun, and the best way to practice them is with a sense of playfulness! They are an opportunity to change our relationship with gravity and explore a different perspective in a whole new way. I hope you’ll join me on Wednesday, January 23, from 5:45pm to 7:45pm to play with and explore these inversions. If you can’t, I hope you take the time to do so on your own or in your next yoga class. Namaste. You can sign up for Tucker’s Inversion workshop here!